Every week we ask our students to vote for which social programme theme they would like. 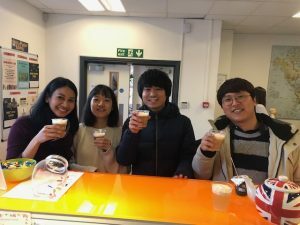 We offer all kinds of themes, some academic, such as pronunciation, grammar and idioms week, and every month we also offer a less academic theme such as Food and Drink, British Culture or Sports week. Last week they voted for one of my personal favourites – Harry Potter week! 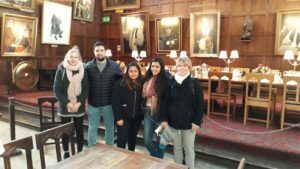 For many of our students, Harry Potter is one of the reasons they chose to come to Oxford to learn English. It is well known that many of the scenes in the world famous films were shot right here in Oxford. 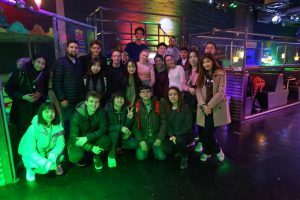 For our students who weren’t familiar with the wonderful Wizarding world of Harry Potter, we gave them an opportunity to explore the city and participate in some unique activities. We kick-started the week with Monday Movie Club, which as the name suggests, involves watching a film in the student lounge, every Monday. The students decided on Harry Potter (no surprise there) so we hunkered down with some popcorn to watch the adventures of Harry, Ron and Hermione. 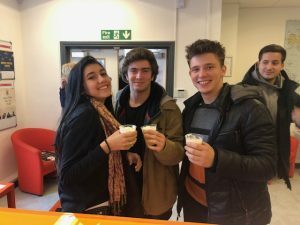 To really bring the books and films to life we offered our students homemade Butter Beer. This delicious beverage was so popular we completely sold out! Unfortunately the recipe is top secret and cannot be given to Muggles – so you’ll just have to wait until our next Harry Potter Week if you’d like to try it! 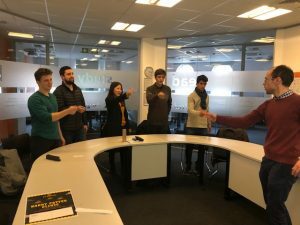 On Wednesday, our Assistant Director of Studies and Harry Potter look-a-like, Rob, offered a Harry Potter themed clinic in which students were sorted into one of the Hogwarts houses based on a completely reliable, Dumbledore approved, personality test. This gave them an opportunity to learn some new vocabulary, intonation, wrist flicking wand action and have plenty of fun at the same time! As the weather was too windy for Quidditch, we decided to play Crazy Golf instead. The turn out was fantastic with around 20 students attending! 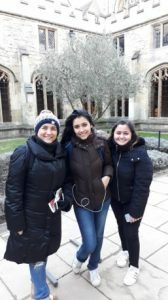 On Thursday the students visited one of the most iconic buildings, not only in the films, but in Oxford its self; Christ Church College. Christ Church provided the location for many scenes in the Harry Potter films. The sweeping staircase was used for the scene where Harry, Ron and Hermione first meet Professor McGonagall, the corridors of the college were used as the endless hallways of Hogwarts, and most famously the Tudor Great dining hall was used for the impressive Hogwarts Great Hall. There are many other fantastic places in Oxford which inspired the films, and we will be certain to include them in our next Harry Potter theme week. Have you been to any of the Harry Potter locations in Oxford? What fun themed weeks would you like to see at EC Oxford?